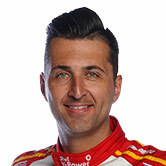 Fabian Coulthard would be happy to end his V8 Supercars career racing for DJR Team Penske, he declared on Inside Supercars. 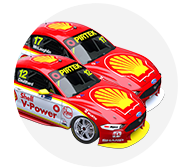 DJR Team Penske is the 33-year old’s fourth full-time home in the category – and this is the one, he says. Already in 2016 he has earned an ARMOR ALL Pole Position and podium finish in Championship races, as well as having had a good showing at the non-championship Australian Grand Prix. His first V8 Supercars race win came at last team Brad Jones Racing, which helped put him on the map after being known for his tremendous Bathurst rollover in 2010. Now he's hoping continuity will help him move forward again. “I’ve had one of those careers where I’ve been on the move every two years – Brad Jones was the longest serving team I’ve been with, which was all going well and we left on good terms,” Coulthard said on Inside Supercars. “But now I’ve found a team I feel like I’d like to finish my career with. Coulthard is still learning about the Ford Falcon FG X and has, of course, found the culture of the team different. He has moved from Melbourne to the Gold Coast to be close to the team. “It’s a lot different – there’s not as many people but the facilities and things like that are totally different. Even from a management level, it takes a little bit of adjusting. While his competitors are gearing up to steer different cars in different categories, mastering the FG X is the priority for Coulthard. He doesn’t want his judgement clouded by throwing anything else in the mix, as he focuses on the main goal – winning races for Roger Penske. “I’m learning the team, I’m learning the car and things like that and I don’t want any outside distractions at the moment,” he said. Roger Penske will be present next round at the Perth SuperSprint and while Coulthard admitted the big boss’s presence can “stress out” some team members, the Kiwi driver enjoyed having him at the circuit. While there is an expectation of wins, it’s all in good time. “They’ve got a plan, it’s not all ‘we need to do this and do that’. It’s structured in a way – like when they did Indy car and wanted to win the Indy 500 it was like a three-year plan. “So they’re realistic about the expectations and I feel like if I sat down at this point last year and both [drivers] had a pole, both had a podium – at this point of the year, you would think that would’ve gone down quite well.